The third, final, and most personal entry of the animation assembled from CLAMP’s X manga series, both for myself and the franchise as a whole. After the middling affair of the direct to video Tokyo Babylon, and the lavishly beautiful but ultimately Earth shatteringly broken character narratives in the X/1999 theatrical film, I have but the X television series to talk about as a part of the series marathon I undertook. I was originally planning to title this whole line of posts something relating to “X-mas in July” (you have seen the time of year we are in, after all, with the 25th being a Friday at that to set this affair up). But I figured that was a joke the anime blogosphere got sick of years ago. Possibly even before the arrival of the 2001 anime television series I am concluding this three part exploration with. In what will probably surprise few readers, I have a bit of a strange history with this series, despite never having seen an episode of it until now. I owned Boogiepop Phantom for roughly a decade before actually bringing myself to watch the entire thing, after all. If memory serves me right, I first came to understand what the X series was via a trailer on one of my anime releases from Pioneer. I could not for the life of me tell you which home video release in particular, but, I do remember quite clearly that the trailer was from the simple and straightforward “show the creditless opening sequence as advertisement for the television show” school of thought. Cheap, simple, usually can do a reasonable job getting a sense of the product, and often more or less filling space on a tape or disc in terms of “value for money” extra features. This all would have been in 2002 or 2003, thereabouts, when the television series was being prepped for and released in the United States. 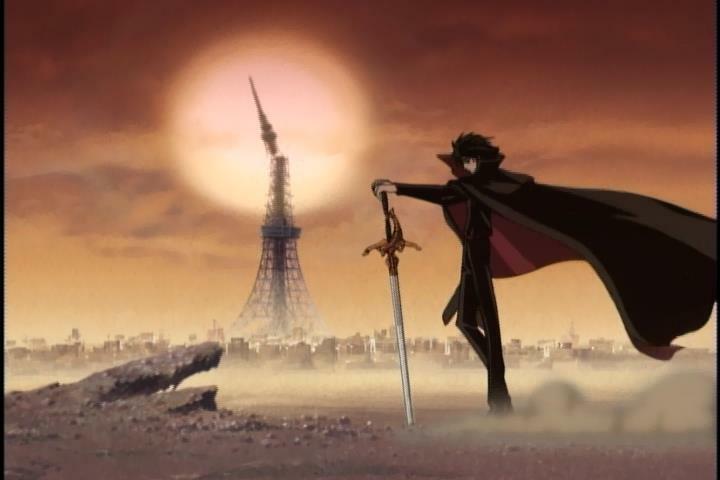 This introduction sequence repurposed as trailer features series lead Kamui Shirō clad in a black cape standing around a ruined Tokyo wasteland, lots of flowing ribbons, feathers, and cherry blossom petals, along with geometrical nods to spheres and the Earth being split in two. I liked the opening song well enough at the time, which is “eX Dream” by Masatoshi Nishimura, that I had to use some really archaic methods by today’s technological standards to record it on my limited hardware and get it on to my computer. A microphone up to the speakers may have been involved. I did this for a number of anime things, mind you. Terrible audio quality, all of them. This being said, there were elements to the visual style of the work that I found compelling at the time. The ornateness of things like the swords, the aspects of the apocalypse being combined with flowery and fabric imagery, or the limited but pleasant character designs I was able to see. This was coming out of the period within with Japanese Roleplaying Games had reigned supreme in the Sega Saturn / Playstation / Nintendo 64 era, which often had their own The World Hangs In The Balance plots with flashy designs. This anime series then, which I would shortly come to learn had a much larger franchise behind it, seemed like it had those kinds of sensibilities but significantly more refined in artistic or narrative intent. A natural extension, if you will. I had absolutely no idea that it was shōjo manga series, as it looked significantly more violent than what usually ends up marketed in that area of the manga section. Once I did learn about the audience the work was originally intended for, that did make it even more interesting in my eyes, as the idea of brutally violent comic marketed for girls seemed like the sort of thing my teenage self felt surprised by. I thought they should have things like that available, and that was pretty awesome, the thought had never really crossed my mind it actually existed as a commercial product. Plus, it had one of the most frustrating yet alluring names one could ever hope for when it comes to an internet searchable name to try and learn more about. The way the anime series was released domestically confused me, namely because I only ever saw the Limited Edition copies of the eight DVD’s the show took up in my territory. This was during the western anime boom years of course, when one could get away with that sort of drawn out release on a twenty four episode show. But, to make matters worse those Limited Editions come with a black textured slipcover that obscures all back of the box synopsis data. One has only a stately, deluxe looking black case that communicates only the title and volume number. Each disc promoting different colors of reflective metallic finish on the lettering, allowing all else to ones imagination. I own two of these releases, oddly enough. Volumes four (which is my favorite number, the midpoint of the show, and uses an orange X) and eight (a gold X, the end of the anime series, and which two fours fit into, which is thematically appropriate for the series). They came into my hands a few years ago, in a box during one of Crunchyroll’s “30 Random Mystery Anime DVD’s For $30” firesales they have tended to run once or twice a year. To this day, most of the contents of said boxes still involve trying to offload retail overstock and liquidations from those gluttonous western anime boom years that ended around the mid 2000’s. Until a week or so ago, these two discs were still sealed on my shelf. I do not have any sales data on X from when it was originally released. But, I can completely understand how hard it must have been to get people to buy a niche import media product when the boxes have little to go off of but the letter X in various shiny colors. Though, the whole set of individual DVD’s from those editions would look very attractive on a shelf together were I ever to desire completing my set. Now that I have actually taken the time to power through Tokyo Babylon, X/1999, and via the magic of Hulu streaming managing to watch X from start to finish while getting to open those long dormant home video cases for their relevant parts, the question, I suppose, is if I would ever want to do that myself. The X television series is the only anime series directed in full by Yoshiaki Kawajiri. Most well known for wonderfully animated high grade cinematic violence and gore action films, such as Wicked City, Ninja Scroll, and Vampire Hunter D: Bloodlust, his directing resume is one that certainly speaks towards the visceral qualities the X series in known for in manga form. In many ways, Rinaro’s X/1999 film is trying to operate from Kawajiri’s playbooks, though with numerous pages altered or missing. 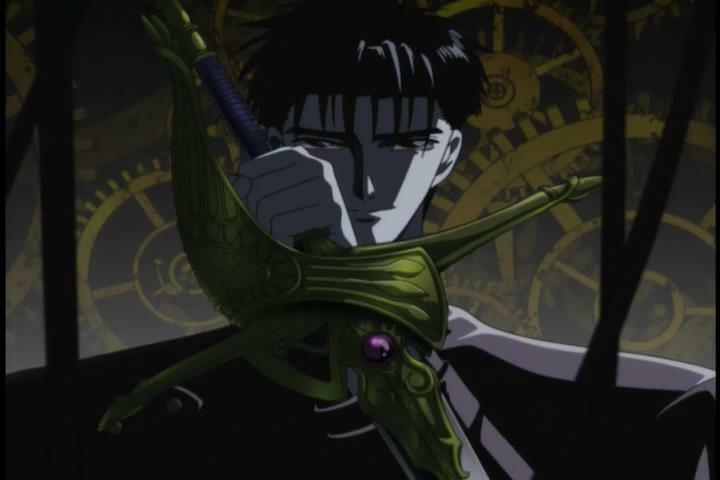 Kawajiri’s take on the material for television broadcast has the distinct advantages of being able to look back on his senior’s work on the film side, as well as significantly more of CLAMP’s manga series having been released in years that followed. He has the enviable task of having more source material to peruse, and more direct senses regarding what pitfalls sunk many aspects of the X/1999 movie. He would get to restart from square one, as the film and television series have no direct narrative relation to each other. They merely use the same general scenario and characters. This also means the onus on him to not screw up, and the lesser amount of slack fans of the comic and general audiences would have granted him, is also higher than ever. As the series is a twenty four episode television package, he also would not have theatrical grade film animation to fall back on to try and feebly use as a smoke and mirrors game for wide reaching narrative gaps. Kawajiri is not exactly known for rich and multi-layered nuanced character drama so much as he is for ways to lovingly direct death and destruction. Given, he can do so with few equals, but X has a very wide character drama that wants to play out as well. This is, generally speaking, far outside of his wheelhouse. Fourteen of the series episodes, over half of X, came to be scripted by him directly. Much like it is amazing how nice looking Rintaro’s film is visually while simultaneously having a smoking crater where its characterization should be, Kawajiri by all accounts should probably have tripped up doing something he should not have and plunged to his own doom here. Yet, when the dust settles and all is said and done come Judgement Day, he comes out looking better than anyone could have expected. As I have mentioned previously in this series of X posts, but will recap a bit if this is the first one you are reading, X is a work of apocalyptic fiction and tragedy. On the topmost level, the narrative follows the seven Dragons of Earth (individuals whose destiny has been oriented to bring the Earth to armageddon, wiping out humanity so the grieving planet may be reborn) and seven Dragons of Heaven (those who had been selected by the hands of fate to shield mankind, that it should continue on regardless of how selfish or harmful its actions may be). 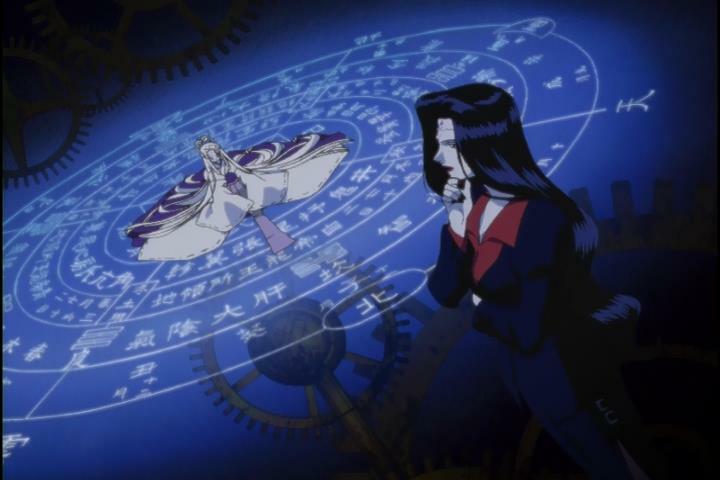 Its in-universe mythology pulls from a variety of western and eastern religious traditions, in addition to some of CLAMP throwing its own spins into the cocktail mixer. Their backgrounds are many, ranging from a shrine priestess and a salaryman copy editor to a member of the Japanese Self Defense Force and a cherry blossom themed onmyōji assassin. The lead figure of the narrative, a one Kamui Shiro, falls into a most particular area where he does not have a preordained future. Or rather, he is certain to side as a Dragon of Heaven or Earth, but this choice presents him with options the others involved in this end of the world scenario do not have. Regardless of if they personally desire their assigned role or not, they are to kill each other as part of the grand universal machinery to see what fate is to befall the Earth, as everyone else on the planet goes about their normal daily lives not knowing how close they are to the end of days. As could be imagined for a story like this to work, the personalities, past histories, and present relationships of the characters involved plays a significant part in the gearwork inherent for it to function. Indeed, a significant visual thematic throughout the series is that of clockwork parts, be they standing still or grinding away and advancing forward. This is where Rintaro’s film crumbled, despite any well intentioned efforts to streamline things, as the number of participants in this dance who require adequate setup and time to get to know is very high. X is designed down to its core as an epic tragedy, in the classical sense, where one generally knows what may happen far in advance but the march forward to those points is to remain to no less engaging for it. Indeed, ideally, that things are to perhaps be more enhanced by the viewer generally knowing what may happen. Be it due to Kawajiri deeply recognizing he should keep his own action movie character writing tendencies in check or not, as a television series X takes things quite slow. Glacially, methodically, rhythmically slow. Even as late as the highest teens in the episode count, mostly full episodes are still being granted to character backgrounds, where they came from, who they are now, their present relationships or worldview, and so on. Conversations often have a very circular, almost theatrical quality to them, where a question may be met with a directly affirmative statement that leads into a series of other personal considerations before wrapping up back with the sentiment expressed in the original first sentence of the response. This is a show largely about predestination. When one has their fate assigned to them in a quite literal sense, one tends to have a bit of unique way of seeing time or conversation. And that can be either highly enjoyable given the situations that creates, or a dire negative, depending on a given viewer. There are plenty of lovely little scenes that play with this implementation throughout. For instance, two adult characters who are to duel each other later happening to be on the same mass transit train from work. So they chat together idly despite fully knowing they are on opposite sides of the conflict. There is no reason to fight on the train, after all. The end of the world battle is between their respective sides, and should the Dragons of Earth lose to the Dragons of Heaven, it is not like they should be committing genocide in the process. There would be plenty of time for that should the Dragons of Earth themselves win, as the arms of time are plenty long as it is. At the same time, this is a definite area I can understand one finding fault with the series in. Even with the occasional Kawajiri directed fight scene, this series takes its time to go nowhere fast. Given the speed it is generally operating at, and the number of characters who need to meet and interact with each other as a part of its story, X is very much a show that plays well to being able to marathon or take in large chucks. Characters have a tendency to sound like they are repeating themselves, and a degree of that verbal ornamentation needs to be taken in the theatrical sense I mentioned or it may just come of as downright interminable. It would be like if one settled in for a wholly consumable action romp and received a German closet drama for their trouble instead. The two need to considered on entirely different criteria, and one needs to be in the right mood for either of them. That being said: without question, in Kawajiri’s version of the Judgement Day struggle, we get glances into each character. Significant regard on where they came from, what they hope for, and so on. We, as they, also tend to know what will happen to them long in advance. Not a matter of simple predictability but more in seeing their fates fulfilled as they themselves knew it always would be on one level or another. The primary X factor, if we can call it that, would be only in what Kamui chooses to do as a part of his narrative for being able to tweak the final outcome of events. Fundamentally, this a very large and complicated clock that wants to build to a very specific chiming moment. And there is a strange sort of contentedness in that, as the characters resign themselves to or embrace the roles they are entrusted with by supernatural circumstances far beyond them. 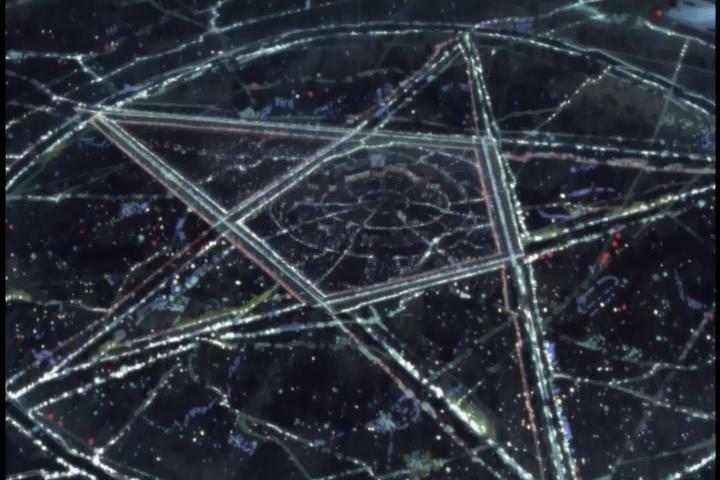 Because of how a star-crossed tragic story like X operates, placing its rules and potential planetary results so openly, there are only so many ways it can resolve itself. This is especially true given the previous X/1999 film, which has its own interpretation for what will happen to Kamui, his friends, and those they meet along the way. As the manga for X remains unfinished, even more than twenty years after it began and largely being on hiatus for the previous decade shortly after the television show wrapped up, as the much prepared for day of destiny rolls forward there was very much a sense of contemplation for what Kawajiri would choose to cap the show off with. Who would win, lose, or even still be alive to keep score at all. I did not know, even after all these years. Thankfully, the order and situations of those who meet their personal end is very different than how events played out in the movie. This keeps similar events fresh and new for someone like me viewing both pieces of media back to back. This carries through even to the finale, which is significantly different in tone. And I appreciated the path Kawajiri and related staff decided to take in doing so. X is an interesting television series to me, mainly because the full degree to which I may like it has itself not fully formed yet even now. It reminds me of certain books, plays, films, or other media where my initial pass is really only step one. Now, I know what the raw text is. I, in a sense, now know the full destiny of these individuals within the confines of their television universe, and the speed at which it plays out. It will be another matter then to go back all over again, to see the gears of fate grind forward to their respective tragedies another time, to consider the machinery and guts more particularly. If elements that once concerned or perturbed me washed away or not, in seeing the setup and execution again. CLAMP works and I generally do not get along so well, on the whole, particularly in recent years. Even so, were they to have a kind of magnum opus given their massive success in the industry over multiple decades, X would by all means be it in my eyes. Unfinished though it may be in manga form, it is a credit to their extravagant vision of dualism, myth, dreams, loss, and the state of the Earth and human society at large today under the eyes of judgement that I remembered the imagery from that introduction sequence after all these years. In mathematics, the letter X is generally used as a placeholder or something with no fixed value as a part of an equation. I do not, as a rule, put scores in the text of anything I write on this blog. But, presented with the notion that as a series X = something, I would certainly say it was good. It achieves its goals beyond expectations, and is more than the sum of the parts that preceded it. As far as you or I could ever know, the world may or may not end tomorrow. I am glad to have been able to at least spend some of that time to finally finish this entire series after all these years. One that once seemed most elusive and unknown, yet attractive when looking at it on store shelves and in home video preview extras. It did not do everything I expected or even perhaps hoped it to do in my initial run through. But, even so, I think that is also quite alright. It will give me something to think of, when I complete that home video set. X is a variable, after all. One could call it fate. I have a lot of nostalgia for the X series – it was one of the first full anime shows I ever bought for myself on DVD – so that probably goes a long way in explaining why I still love this anime so very much. Personally, the slow pacing didn’t (and still doesn’t) particularly bother me. I’ve always preferred more character-driven titles, and I don’t think tragedies fundamentally work on any kind of emotional level unless you have time to become attached to the characters to begin with. Without their respective backstories and at times quite complicated relationships with one another, I doubt I would have cared about the overarching story all that much. I can see why it might frustrate viewers who go in expecting something far more action-heavy, however. I guess it was just my luck that I went with no expectations either way and ended up with something that appealed to me in such a personal way. Oh, by all means, I actually rather support the very measured pacing choices Kawajiri decided to go with. It is certainly the most complicated set of narrative machinery he has taken on, especially from someone who normally directs action films than character drama television. I think it is interesting in that the series is designed very much to perhaps be best consumed at a marathon or home video pace – I think were people today watching X week by week over two calendar seasons, I think some would quit on it before it actually manages to reach its apex point. As it is definitely a show that, given that most of the tragic character fates are appropriately foreshadowed far in advance so we know their fate just as well as they themselves do so we can walk those paths with them, is laying out a lot of groundwork to essentially deliver on a singular moment of up in the air variable decision near the end of its series of tragic events. It’s a really, really interesting little series of gears, in that respect, because by making the choices it did I do think it demands that I rewatch it at some point having all of the answers before being able to give a fuller or more robust opinion on it than I really could here. Much like how one would would re-read classic theatrical tragedies or such, having already previously come to know the paths that lead some to ruin or not, and then suss out new facets in further explorations. So in that respect, I think that is a really great credit to the show, that I do already know I will have to be back with it again someday. The funny thing is despite the series beeing definitely slower than the film that I felt it was subtly pressed. While reading the manga I felt the time more loose. Then again 10 vols to fit in 24 eps is still quite a feat. Glad you liked it in any case. X holds a really fond place in my heart probably due the resolution of that annoying cliffhanger. The end did read like CLAMP after all. Yeah, X TV felt like something of a tight fit, though at the same time I can not really slam it for dragging. It has a lot of characters to work with, and it can give most of them their own whole episode planks across the larger narrative bridge, and so after the credits roll things do feel a lot more puzzle piece like. Or mechanical gears whirring away, like a lot of the visual imagery. 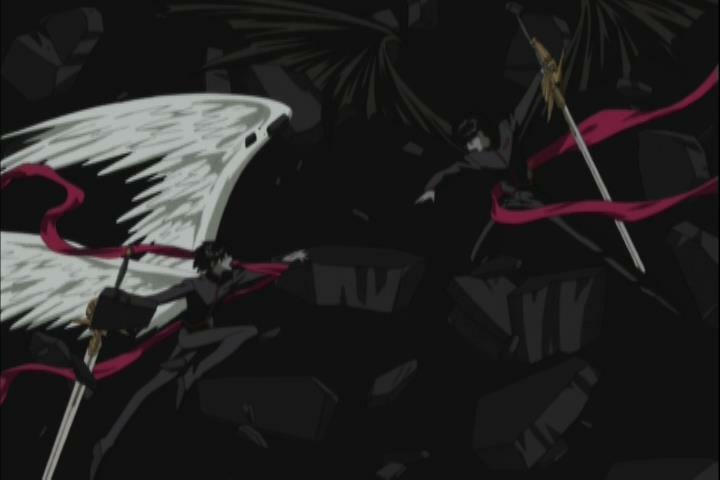 And it can be a tough sit for twenty sit episodes without the right mindset, since the Dragons of either side are aware that while they are important (even preordained), the final outcome of their story will be between Kamui and his Twin Star. So it is this very large set of interactions, while the characters are also recognizing the one “real” variable is what choice will be made right at the end. I think as a result if I was just busting along to see the television ending (which I am sure some folks do), I probably would have had a much worse time with it. So I am glad I made X TV part of a larger viewing project. For me, at least, was an experience where I seeked to see the cast interact and not only the end. X is the manga I consider CLAMP’s masterpiece and was my first contact with gore as well as fully fleshed characters. I love them all so much; they’re incredibly interesting.